Bee Garrell stands next to her silver Toyota Prius as she assesses the damage done to it. Bee Garrell was returning to her car from class in hopes of preparing for a trip back home to South Carolina, but now she can’t because her car is totaled and there’s no family around to help her. 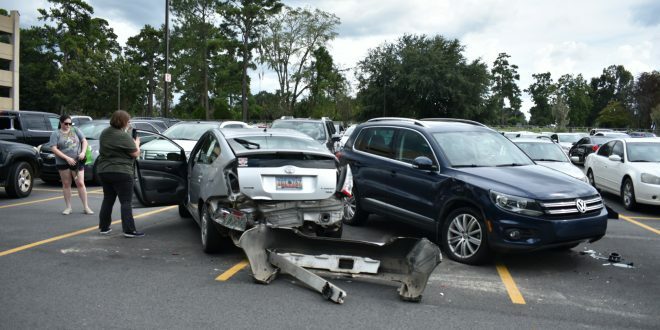 On Sept.6, she and three other Valdosta State University students came back to Oak parking lot only to find their cars either totaled or damaged. Garrell, a junior, and Sophomore Kyrie Kato’s cars took the worst of the damage and aren’t feeling too great about it. “I feel really sad because now I don’t have a car,” Garrell said. According to Kato, University Police told him the perpetrator was allegedly trying to swat away a bee that entered his vehicle and uncontrollably swerved into Garrell’s silver Toyota Prius because of it. The swerve and the force from it created a domino effect where each vehicle hit its neighbor until it lost momentum. UPD confirmed this information in their crash report, estimating the crash to have occurred around 1:35 p.m. and revealing the perpetrator to be Torrey Hargrove Palacios. Witness Madison Rock told UPD that Palacios had already sped around the side of one of VSU’s shuttles before being allegedly distracted by the bee. 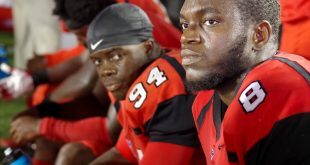 However, the entirety of VSU wouldn’t have known about the accident had it not been for Junior Kalah Hawley, who observed it as she was walking with friends through Oak. “I was walking back to Centen (Centennial Residence Hall) from main campus and then we saw the bumpers and saw the rest of the poor cars,” she said. Hawley found the cars at 2:07 p.m. and said she put herself in the position of the cars’ owners and thought posting on Twitter may help inform them quickly. “If it was my car I would want to know as soon as possible and the fastest way of finding things nowadays is social media,” she said. Kato saw the post only after finding his wrecked vehicle but he was surprised how much buzz it got. Both Kato and Garrell have contacted their respective insurance companies, however, Garrell’s car is still stuck in Oak parking lot. She said Palacios has yet to report the accident so the car is unable to be moved. 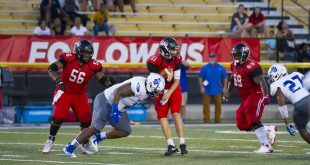 This article was updated at 1:27 a.m. on 09/18 by Bryce Ethridge. Next Column: Did Nike Really Do It?